I live in Harrogate, North Yorkshire, surrounded by great countryside and a lot of very good riding. I went to "BespokedBristol - The UK Handmade Bicycle Show 2012" as a new builder. The main aim was to find out if anyone would actually pay me to build them a bicycle. Not a full-time business as I actually enjoy my day job, but to allow me to continue building bicycle frames and make a bicycle which fulfills their needs. I started building bicycle frames for two main reasons. 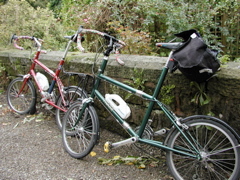 The first bikes I built on my own were touring bikes and the first two were seen together at the Folder Forum in Weymouth in 1997. We rode these in the UK and the Netherlands and I still use mine for shopping so it's looking a bit battered now. 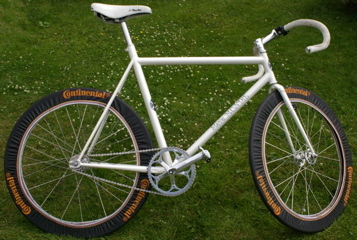 The first fixed-gear was built pretty much to ride on the rollers, although I liked riding on the velodrome at Manchester so much I rode this first trackie there a lot. But I wasn't quite happy with the riding position (too upright) and I thought I could do a better job. The better job came with the white track bike, again in 35mm Columbus tubing. A longer toptube made the position less upright and the handling on the banking was better. I rode this bike at the World Track Masters in 2004 (although I'm not a racer) but mainly I simply ride round with my friends. I wanted to build a frame with higher-spec tubing so the next frame was Columbus Max. When I saw the lugs I decided to make it lugless again. Originally blue and yellow. it got resprayed orange and an extra bit of bling with some bar-end-stops and a head-cap made by a local jeweller with a beekeeping theme. 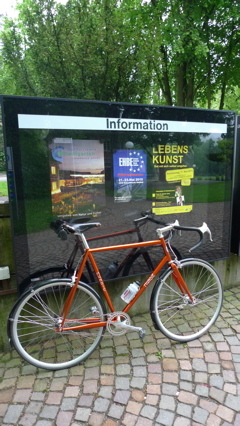 I visited the European Handmade Bicycle Expo in 2010 and took this bicycle, by train. I hated that bike box by the end of the trip. I didn't exhibit the bike but used it to get about and ride the Saturday "early bird" ride. This is currently my regular bike when I'm out for a ride with friends. However due the the hilly nature of North Yorkshire I tend to suffer on the long descents. although uphill is fine. 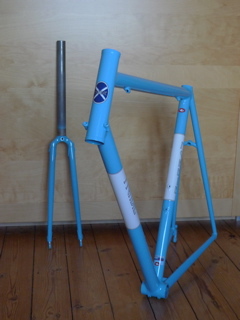 In an attempt to my downhill experience an easier one I built the blue and white Zona-framed roadbike. As Zona doesn't have a 32mm seattube I've had to use Decacciai for the flowed-in look I wanted. All rounded out with Campagnolo Athena 11 speed compact in alloy. And of course a steel fork.